On April 19, 2017, a new cultural institution, the Museum of the American Revolution, will open in downtown Philadelphia. It will present relics of the Revolutionary War to the public as a way of telling the dramatic story of the nation’s founding. 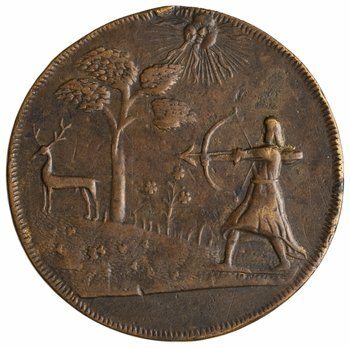 For their inaugural exhibition the Museum of the American Revolution requested the loan of 12 eighteenth-century medals from the ANS. Several Colonial-period Indian peace medals are included in this loan. These medals were issued as tokens of friendship to members of Native American nations to gain their support and allegiance. 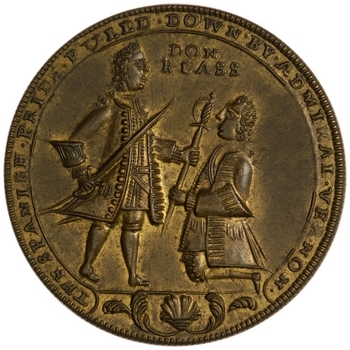 This group includes two of the earliest Indian peace medals known: a British bronze medal with the image of George I (1714–1727) and a Native American hunting a deer with bow and arrow (fig.1), and a French silver medal with a bust of Louis XV (1715–1774) on the obverse, signed by Jean Duvivier, and a reverse depicting two warriors reaching out and clasping hands, the man on the right representing France, with the other representing the Indian allies of France (fig.2). Fig. 1: Great Britain. Bronze Indian peace medal. George I (r. 1714–1727). (ANS 1921.132.1, purchase) 40 mm. Fig. 2: France. 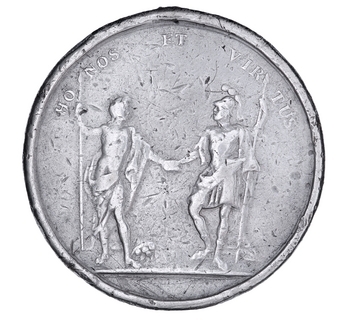 Silver Indian peace medal. 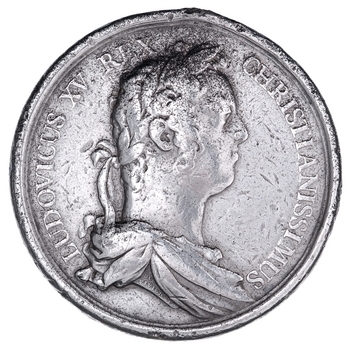 Louis XV (r. 1715–1774). (ANS 1925.109.1, gift of John W. Garrett) 55 mm. 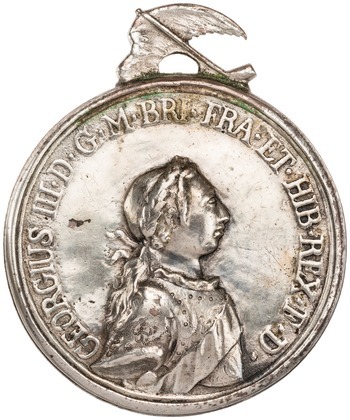 It is interesting to observe that on another ANS example of this Louis XV medal the name GORGE III [sic] was engraved over LUDOVICUS XV (fig.3). Fig. 3: France/Great Britain. 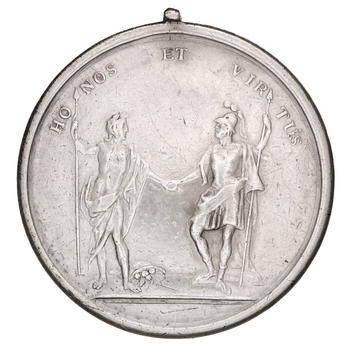 Silver Indian peace medal. Louis XV (r. 1715–1774)/George III (r. 1760–1820). (ANS 1925.108.1, gift of William B. Osgood Field) 55 mm. 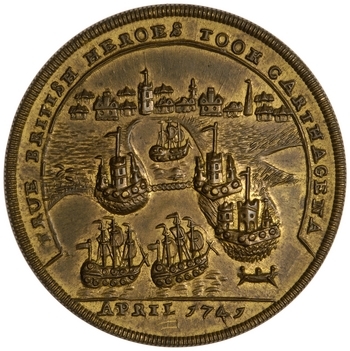 Another remarkable medal in this group was issued at the time of Pontiac’s Revolt in 1763, a conflict named after the Ottawa chief who led the Indians of the Great Lakes region against British rule after end of the Seven Years’ War resulted in the transfer of claimed sovereignty over their lands from the French to the British. 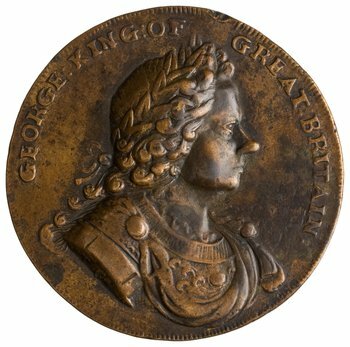 The obverse of this medal shows an armored George III with a legend containing his usual titles. The reverse depicts an American Indian and a uniformed British officer seated on bench under tree, smoking a pipe of peace (fig.4). Fig. 4: Great Britain/United States. 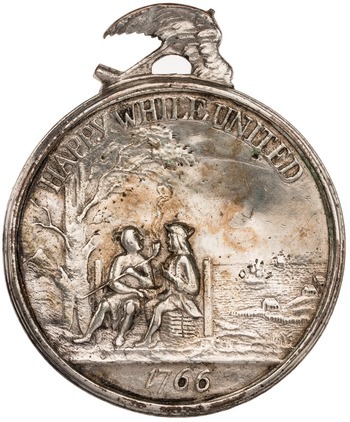 Silver Indian peace medal, “Happy While United”, 1766. 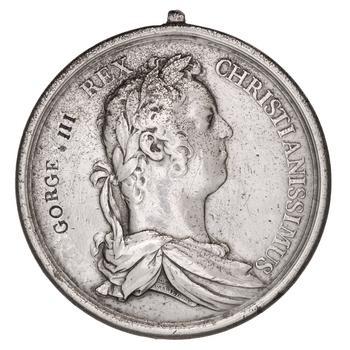 George III (r. 1760–1820). (ANS 1925.173.1, purchase) 59.6 mm. These early Indian peace medals carry immense historical importance both as landmarks in American colonial history and as symbols of the importance that the colonial powers placed on building alliances with the Native Americans. This portion of the exhibition explores the consequences of Anglo-American victory in the Seven Years’ War for the diverse peoples of North America, including former French and Spanish colonists living in the newly expanded British dominions and Native American nations of the Great Lakes and trans-Appalachian West. Fig. 5: Great Britain. 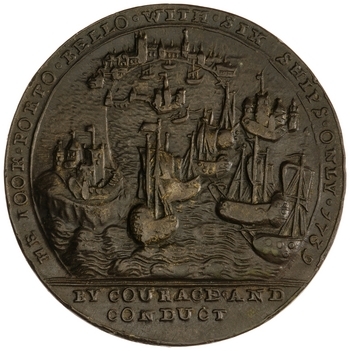 Bronze medal commemorating the capture of Portobelo in 1739 by Admiral Edward Vernon (1684–1757). (ANS 0000.999.38125) 36.5 mm. Fig. 6: Great Britain. 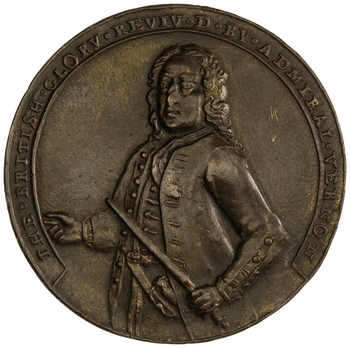 Bronze medal commemorating the siege of Cartagena in 1741 by Admiral Edward Vernon (1684–1757), with Admiral Chaloner Ogle (1681–1750) and General Thomas Wentworth (c. 1693–1747). (ANS 1977.135.748, purchase) 38.3 mm. Also among the ANS items on loan to the Museum of the American Revolution is a group of Admiral Vernon medals (figs. 5–6), exhibited in a gallery that introduces visitors to the Anglo-American sense of shared glory in all things British during the French and Indian Wars. These medals were issued in celebration of Admiral Vernon’s campaigns in the War of Jenkins’ Ear. On November 21, 1739, Admiral Vernon attacked the harbor of Portobelo in what is now Panama with six ships. After brief resistance the Spanish garrison surrendered. The British force destroyed the harbor fortifications before they left and returned to their base in Jamaica. Vernon then assembled a larger expeditionary force for an attack on Cartagena in what is now Colombia (fig.7). Fig. 7: Great Britain. 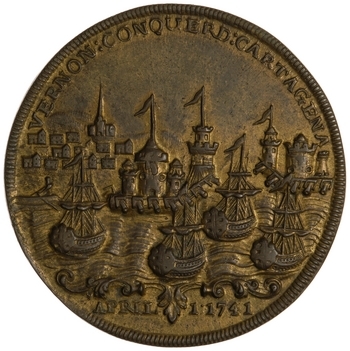 Bronze medal commemorating the siege of Cartagena, 1741. 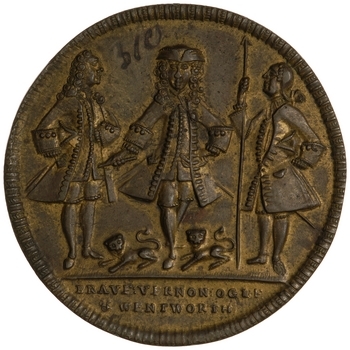 Ironically, although the siege was a costly failure for the British, this medal imagines the Spanish commander, Don Blas de Lezo (1689–1741), kneeling and handing his sword to Admiral Vernon. (ANS 0000.999.38214) 37.6 mm. When this fleet set sail in 1741 Admiral Vernon was commander of more than 50 warships, with 12,000 soldiers from England and the American colonies, many of whom died of disease during the futile campaign. Among the American survivors was Captain Lawrence Washington, half-brother of George Washington, who went on to name his home Mount Vernon after Admiral Vernon.